Card-making-magic, Issue #011--Sunshine and Cardmaking. Well Spring has finally arrived here in England and the Daffodils are bobbing their pretty heads everywhere. Don't you just love the sunshine? Everything looks so much better when bathed in the light. I hope you all had a really good Easter, and didn't scoff too much chocolate. We had a lovely refreshing break in Harrogate, and visited the "Great Northern Papercrafts Extravaganza" (GNPE) show. Some of the products will be featured in cards I am making for the website and I will pass on any good tips I picked up along the way. Since the last E-Zine I have added some lovely projects for you to try. Some are really easy to do. and not a ruler in sight. 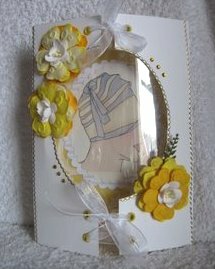 This Beautiful Card is also featured...and has instructions for you to make the Special box to give your creation in. 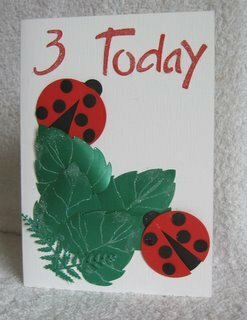 If you enjoy crafting with children then the new section for Novelty Cards may interest you. Some of the ideas need nothing more than a circle punch. Get the kids to make these bugs for themselves, in any color they choose. They would make ideal invitations, especially to a garden type party. This card has been re-named "Shutter Card", and has been on the website for a while, but so that you don't think it has been removed I have added the link. It was originally the Kinetic card but as that word encompasses so many designs I thought it better to change it. 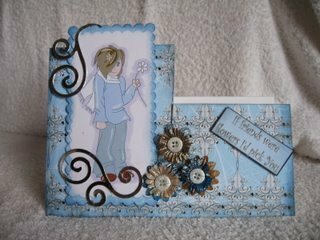 So now you will find lots of different ideas in that section from Penny Sliders to Waterfall Cards. Lots more things have been added to the website, and another new video is also on it's way. I hope you continue to enjoy your visits, and don't forget to leave your comments. Thank you to the people who send me your chatty emails, and a special thank you to the lovely people that send me the photographs of the creations they have made. They are all wonderful. Keep them coming please, it is an honour to get them. There are lots more interesting and fun projects in the pipeline, but they all take time, so please pop back often to keep up to date with them all.